AVAST YE: It’s International Talk Like a Pirate Day! 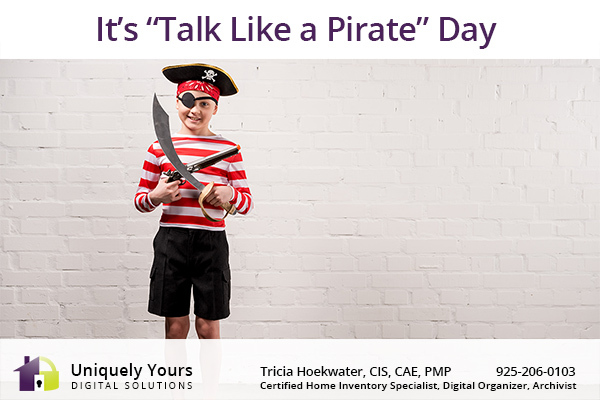 “INTERNATIONAL TALK LIKE A PIRATE” DAY: It’s a day just for fun to let out the pirate in each of us. Practice up your “pirate-speak” in anticipation of this day. The conversation will be lively. Aye, Matey! All hands hoay = Everyone get on the deck. Avast ye = Pay attention. Dance the hempen jig = To hang someone. Hempen halter = The noose used to hang people. Shiver me timbers = An expression used to show shock or disbelief.